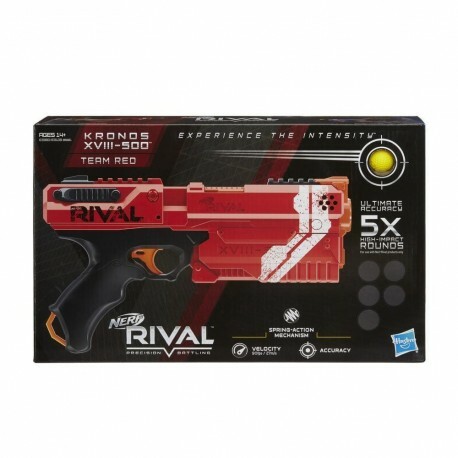 Take on opponents as Team Red with the spring-action Nerf Rival Kronos XVIII-500 blaster! Open the breech to load 5 high-impact rounds, prime it with the spring-action mechanism, and pull the trigger to unleash 1 round. The blaster fires rounds at a velocity of 90 feet per second (27 meters per second). A trigger lock prevents the blaster from being fired accidentally. The ready indicator shows when the blaster is fully primed. The tactical rail lets battlers customize the blaster with Nerf Rival gear and accessories (each sold separately). Battle as Team Red and experience the intensity of Nerf Rival battles with the Kronos XVIII-500 blaster! 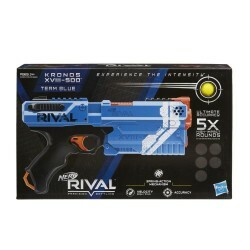 • Includes: blaster, 5 rounds, and instructions.